In Piacenza this school year 1,455 pupils* from 11 schools took part in the campaign. Some of them "drove" daily with their pedibuses to school and collected "Green Miles" all year round. There are now 21 different pedibus lines on which 320 children take part and thus collect another 48,000 climate miles on the daily way to school. As a special motivation, the pedibus was also accompanied by a jazz band. In addition, an action day was organised, during which 2,823 participants took a walk and were thus able to collect additional miles. With their actions, the children were able to contribute a total of 76,595 "Miglia Verde". 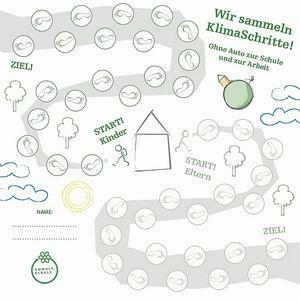 The municipality would like to participate in the Climate Mile Campaign again next year in order to influence the habits of the children and their families in a sustainable way and to promote a more climate-friendly lifestyle. Piacenza is also collecting steps to the moon as part of another campaign. More information can be found on the website. Throughout the school year, 275 little climate protectors* from 5 different schools in Sacile made their way to school by "pedibus". The children thus managed to collect a proud 57,200 "Miglia Verdi". This year, 24 schools with 138 classes and 2,063 children took part and, with the support of their parents and teachers, collected 38,721 climate steps by the handover date!